Psychology professor Bruce Tuckman published a paper in 1965 in which he described his theory of team development. According to Tuckman, a new team goes through four distinct phases when first forming. Team development does not always occur in a linear fashion. A complex interplay of many variables means things can take an unexpected turn at any time. The underlying cause of change might not be obvious. Having a framework for analyzing and comprehending the changes taking place in a team can help discover ways to increase its efficiency. People are complex, unpredictable creatures. It follows that interactions among team members are also hard to predict. Tools like Tuckman’s model that track this kind of development are few and far between. The distinct feelings, behaviors, and team tasks of each phase provide a paradigm from which to anticipate common challenges groups often face. Being able to guide a group’s development accordingly can prevent many potential problems. The first stage of Tucker’s group development is the forming stage. During the forming stage of a group or team, a leader should look to the initial phase of Tuckman’s group development. It’s common for team members to experience a mix of excitement and anxiety when a new team gets created. Anxiety can stem from the uncertainty inherent in being part of a new mix of people. Will my skills fit the situation, and will they be up to par? Will my teammates accept me? Will conflict be easy to avoid, or will it be inevitable at some point? These kinds of questions may be running through the minds of those who have been assigned to a new team. Behaviors that take place during the forming stage often include an abundance of questions relating to the feelings the new team members are experiencing. The primary task of a new team during formation is to articulate and formalize roles, structure, intentions, and goals. The forming stage tends to focus energy on establishing a team’s identity and objectives. Task accomplishment might be minimal as a result. During the forming stage of a group or team, a leader should consider what the storming stage should look like. 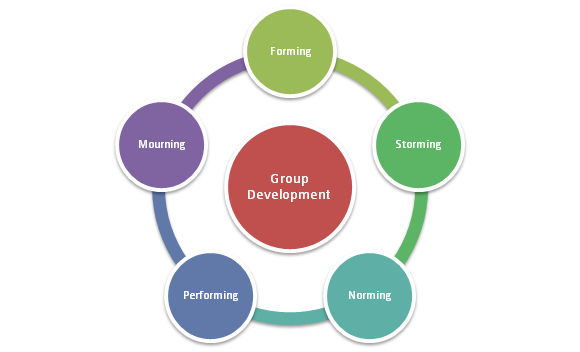 The second phase of group development is referred to as storming. As the term emphasizes, the feelings of team members often drift toward frustration at this point. The anticipation and anxiety associated with the forming stage have now given way to the realities of problem-solving and all its intricacies. Behaviors might be less polite during this time. Tempers can run high as disagreements become commonplace. Anger may be directed at other team members, the team leader, or upper management. Arguments happen frequently. During the forming stage of a group or team, a leader should contemplate what the norming aspect of group development should look like. 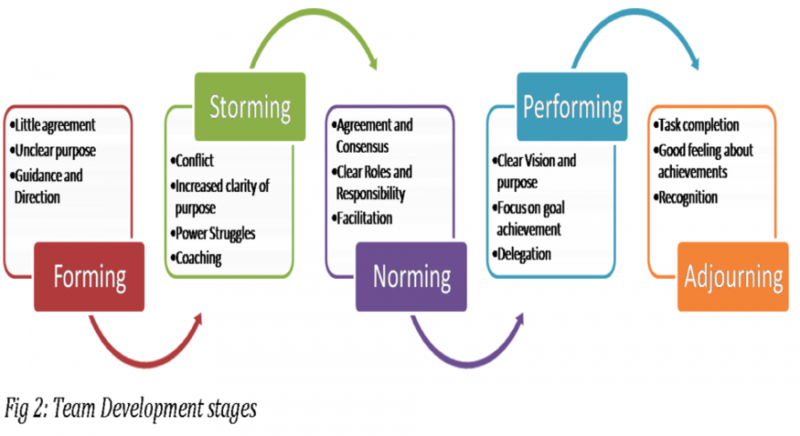 The norming stage involves a normalization of team members’ personalities and expectations. Appropriate social norms become established and agreed upon. Team members accept each other. Constructive criticism becomes possible. Members may engage in more meaningful or productive conversation. Some might even develop their own language involving nicknames and inside jokes. The team task at this stage is to shift toward increased productivity and evaluate the team’s processes. During the forming stage of a group or team, a leader should focus on how they want a group to act during the performing stage. The performing stage is the most productive stage. By now, team members understand each other. They feel a sense of satisfaction in their part of the team’s success. Members exhibit a more positive attitude and become able to resolve conflict, assign tasks, and achieve goals with ease. Productivity reaches its peak. Team progress and accomplishments can be measured at this point. Successes ought to be celebrated. Preparations for the termination or “mourning” phase of dissolving the group can be considered as well. During the forming stage of a group or team, a leader should keep in mind the four phases of Tuckman’s group development model. The forming phase plays a key role in determining how the team might function during the storming, norming, and performing phases. Setting clear goals for each phase allows leaders to make every effort possible to ensure a team’s success.